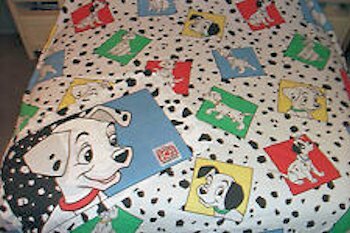 I’m looking for a 1992 Bibb Company 101 Dalmatians multicolored quilted blanket. The company is out of business. I do see the fitted sheets for this particular design and same company, but I need the toddler blanket. The top of the blanket is 50% polyester and 50% cotton, and the bottom fabric of the blanket is 100% polyester. My mother gave me this blanket when I was born. When I turned four, both my parents died at the same time. Throughout my childhood it was my #1 comfort lovie through everything. I brought it with me everywhere. In fact I had it up until I was 20 years old, but it was very worn and had holes in it. I lost it because we had to move with three hours notice and pack everything in a tiny car. I put my blankie in a small suitcase and told my husband to bring it several times. We moved 6 hours away that night. About two hours away I realized it was gone, and I cried my eyes out and called the neighbor of the house I left. I gave her detailed information about where it was. She happily exclaimed she found it, but wouldn’t be able to give it to me til 2 months later. I waited those two months, but the day she came…it wasn’t my blankie at all. My heart was broken. I sobbed every day for two months and endlessly tried searching for it online. I finally had the chance to go back to the house, and I searched the whole house for two days and never found it. I found the suitcase it should have been in, but it was empty. I assume it was thrown away, because it was so old and tattered that no one would imagine keeping it. I would be so, so happy if you were able to help me find this blanket. It would mean the world to me, since it has such extreme sentimental value to me. Oh feck, thats the sheet, i will keep looking! I thought I left the comment before, but here goes again….. If you can get the sheet, perhaps you can find a seamstress or quilted that could make the comforter in much the same way people make ( race) T shirts quilts Good luck. Kinda pricey though. Maybe email the seller and explain the situation. Good luck.